My husband grew up with a Scandinavian mother who always made rosettes for Christmas. He loves rosettes because of the wonderful memories that go with them. This is a really wonderful cookie that is light and delicate, and to be honest with you a real pain in the rear to make. 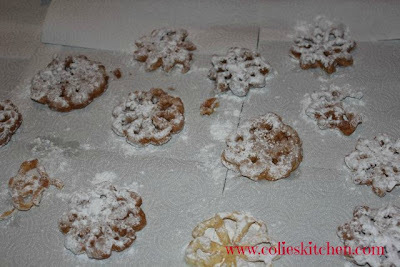 These cookies are so delicate that any wrong move while removing them from the rosette irons will cause them to break. If the batter is too thick the cookies don’t turn out, if you fry them too hot they don’t turn out, and if you live in a humid climate like I do they take forever to dry out enough to stay crispy and half the time they don’t stay crisp. If you have the time and patience to make these I highly recommend doing so. They may even become a tradition in your home like they are in ours. Sprinkle rosettes with confectioners' sugar.